A healthy, moist, and delicious steamed cod. 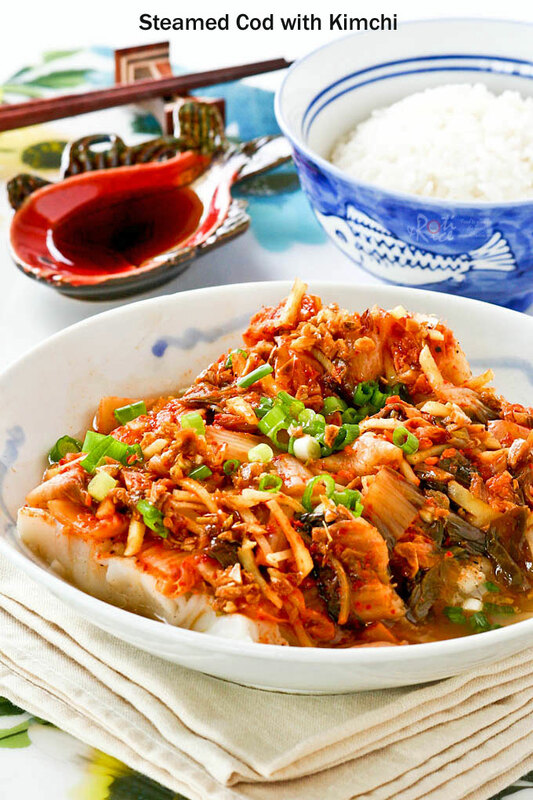 The kimchi combines beautifully with the cod to give it a slightly spicy and tangy flavor. I try to prepare fish at least once a week. Unfortunately, the choices of fish at my local grocery store are not great and so I usually end up cooking salmon. This week though, I managed to purchase a great looking piece of cod and it was on sale too! It did not matter that I had no clue as to how I was going to cook it. I was just happy that it will not be another piece of salmon at the dinner table. Don’t get me wrong. I do like salmon but it is always nice to have something a little different every now and then. Satisfied with my shopping for the day, I drove home thinking about other things. 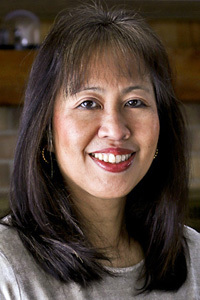 When I got home, I unloaded the groceries and lugged them into the kitchen as always. As soon as I opened the refrigerator, I was greeted by this huge bottle of Napa Cabbage Kimchi sitting on the top most shelf. I knew instantly then what I was going to do with the piece of cod I had just bought. 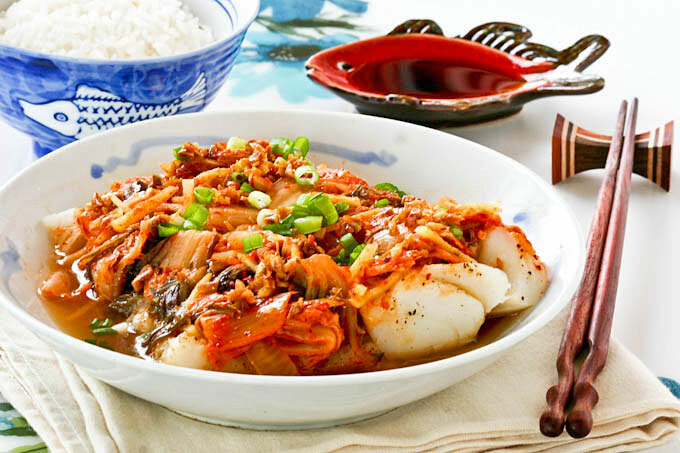 We have not had steamed fish in a while, and cod is a wonderful fish to use for steaming. 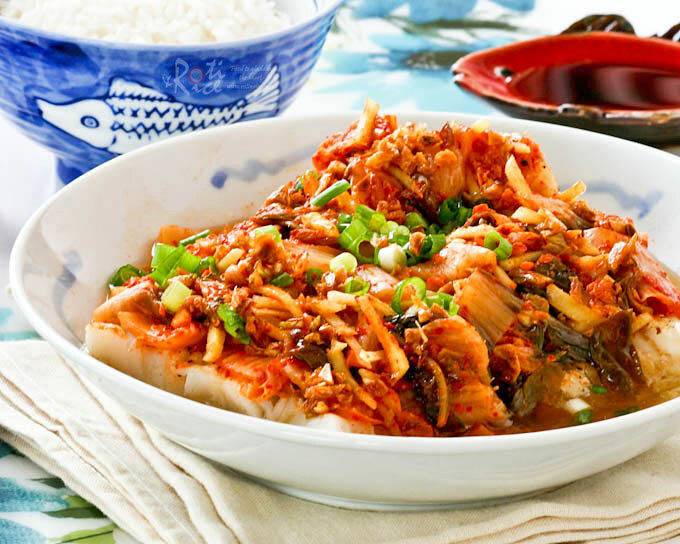 I figured the mild cod would benefit with some flavor boost from the spicy and tangy kimchi. Place cod on a shallow bowl. Sprinkle salt, pepper, and ginger all over the cod. Place sliced kimchi on the top. Fill a large pot with about an inch of water. Place in a metal rack or stand in the middle of the pot. Bring the water to a boil. Place the dish with the fish on the metal rack then place lid on the pot. Reduce heat to medium and allow fish to steam for 12 to 15 minutes. When cod is done, it should flake easily. Place minced garlic and vegetable oil in a small microwave safe bowl. Microwave on high for 1 minute 30 seconds. Remove and mix in soy sauce. Set aside. Remove fish from the pot and drain off some of the liquid. Drizzle garlic oil over the fish. Garnish with sliced green onions. This is so flavourful and yum! I was very happy at the way the dish turned out. We thoroughly enjoyed it. I like both as well. Salmon is quite easily available here. Not so much with cod but the supply is not too bad. Thanks Jean! It was very flavorful and we enjoyed the dish. Good use of kimchi, Biren!